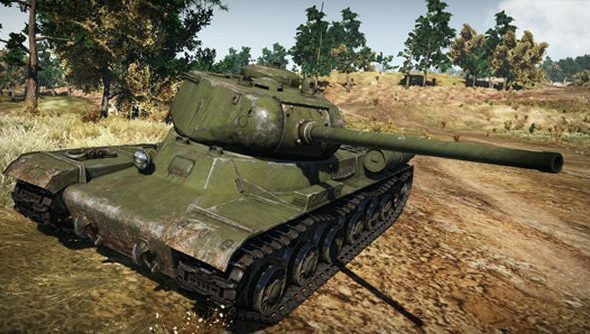 The upside of War Thunder’s long-awaited Ground Forces expansion is practically vertical. Why not couple seamless ground combat to what’s already the most compelling sky-fighting sim around (sorry, World of Warplanes, sorry sorry sorry)? Well, here’s why not. Because every significant update from now on will be filled with incomprehensible-named tracked vehicles, which I’ll have to try and type. Today, it’s my duty to announce that the second wave of Ground Forces’ closed beta merits a slews of new tanks, including the JaguarPanther IV-B, the T-3PO 1942, and the PzKpfwsxz]]/// Ausf.H. It says here. Thankfully, the tanks promise to be more aesthetically and tactically diverse in the field than they are on the page. Meanwhile, Gajin have come to some interesting conclusions about the viability of tanks on their existing air-focused maps. Makes sense. Is this going to be the ground-to-air-and-back-again game to rival Battlefield, do you think?